Hesston College met its fundraising goal of $5.25 million to secure a $750,000 challenge grant from The J.E. and L.E. Mabee Foundation for The Be Greater capital campaign, which will provide facility renovations and additions for the college’s nursing and athletics programs. The challenge grant fundraising was completed ahead of the late-December 2018 timeline. “We are so grateful to the supporters who gave gifts to this campaign to provide quality facilities in the college’s two largest programs,” said President Dr. Joseph A. Manickam. Fundraising for the campaign opened in a quiet phase in the summer of 2016, during which administrators and development officers worked to secure lead gifts. In May 2017, the campaign moved into a public phase after securing about $2.4 million in formal pledges and gifts. In addition to the building campaign goal, a second fundraising goal was also met by fulfilling an $800,000 endowed scholarship component. With more than $200,000 in the endowed scholarship fund prior to the campaign, the addition raises the total above $1 million and will provide $50,000 of annual awards to students. It also creates the opportunity for the first ever full scholarship to potentially be awarded for the 2019-20 academic year. “Our alumni and partners believe in Hesston College and the work being done to prepare students for careers while also offering them opportunities to grow personally and spiritually,” said Manickam. While groundbreaking is being planned for early December, the college needs to secure an additional $200,000 to ensure all of the plans can be carried forward to completion. With about 41 percent of student population enrolled in the college’s nursing and pre-nursing programs, and 36 percent who are athletes, nursing students and athletes comprise the two largest student populations on campus. The campaign will improve on and add to facilities within these areas, as the current spaces are not sufficient to accommodate program needs and inhibit the full student experience. Each portion of the campaign carries a $3 million price tag. A building completed in 1952, last renovated and added to in 1996, is what has been the home of Hesston College Nursing for more than 20 years. The success of the nursing program and its continued growth over many years has rendered the current space inadequate to properly fit the program and address the needs of aspiring nurses. 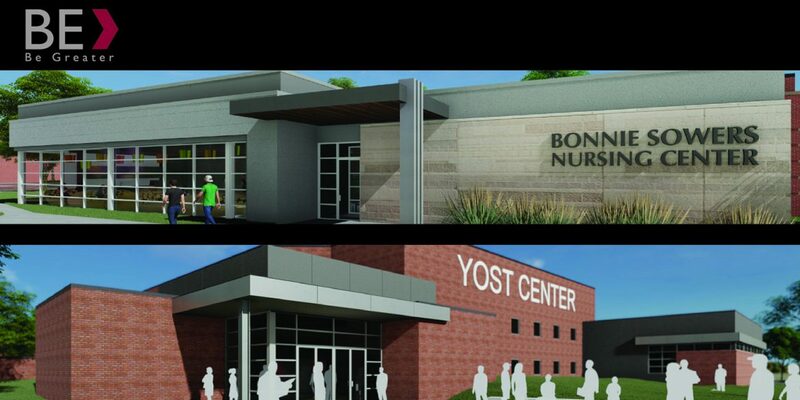 Campaign improvements for nursing include a 9,740 square foot addition to be named the Bonnie Sowers Nursing Center in honor of the program’s director for 37 year who retired in 2018. Also part of the improvements are new simulation labs, student practice rooms, a fundamentals lab, an administrative suite an faculty offices, a student lounge, study spaces and new restrooms. Lark Athletics headquarters from Yost Center, which was built in 1982 at a time when the college fielded six intercollegiate teams with about 80 student-athletes. Today, student-athletes number more than 150 across 14 teams, and the need for additional space to accommodate the programs is important. Campaign improvements for athletics include the addition of an approximately 3,000 square foot weight room on the southwest side of Yost Center that will serve student-athletes and all students, a new on-campus softball diamond, the addition of a new lobby on the northwest side of Yost Center that is a more direct and welcoming entrance for campus guests, a coaches office suite that will accommodate all coaches in one area, and the renovation of the main gym, including updated bleachers, flooring and a fresh interior. Learn more about the capital campaign and how to contribute to the overall goal.